Yesterday was Jon and my two year anniversary. Only two years because we married later in life, but that just means that we are more settled in our lives and careers, and have a bit more disposable income to do discretionary things! Jon let me pick the wine that we opened to toast, and I looked through the wines we have and selected The Four Graces 2007 Willamette Valley Pinot Noir. I was in the mood for a good Pinot, and it has been awhile since we’ve opened a Four Graces wine. The Four Graces is located in Dundee, Oregon, right off Highway 99. The tasting room is in a neat white farmhouse, with vineyards stretching out back. The tasting bar is right in what was originally the living room, and then they have some seating areas in two adjoining rooms. The atmosphere of the tasting room is warm and lively, and every time we have been there it has been pretty busy. The other patrons are always really friendly, and I’ve found myself in conversations with new acquaintances! I wish I could say that’s the case with all tasting rooms, but The Four Graces is rather unique in creating this vibe. The 2007 Pinots tend to be light and soft, because 2007 was a difficult year. The summer was cooler than normal, which made the ripening process go more slowly than normal, and the harvest period saw between 5 and 6 inches of rain, which threatened to ruin a whole lot of grapes. As a result, a lot of the 2007 Pinots don’t have the same robust structure as some of the other Willamette Valley Pinot vintages. Not so with this wine. I wasn’t sure what to expect, since it had been awhile since we had tried Four Graces, and I was surprised by the darker cherry color and bold substance of this wine. It still has a light mouthfeel, but I certainly wouldn’t describe it as soft. 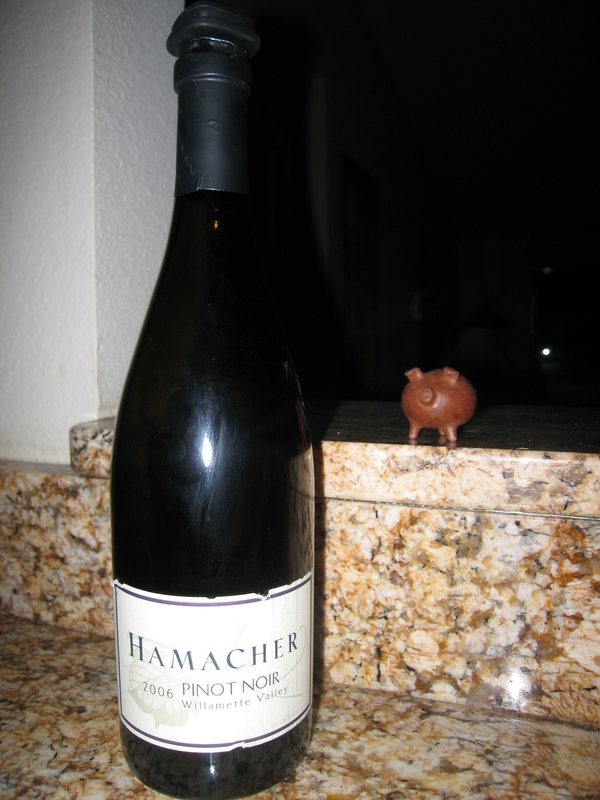 The dark cherry flavor is infused with a lot of smoke, and almost none of the tartness that is typical of a Pinot. When we last left off, we had just gotten to the Etowah Indian Mounds, just outside of Atlanta, Georgia. Etowah was a native American village site as far back as 900 AD, which was used by the Mississippian culture (it got the name Mississippian culture because the first village sites they found from this culture of Native Americans were in the Mississippi River Valley). The culture built mounds for the village leaders to live on top of, and they erected structures of ceremonial significance on top of the mounds. 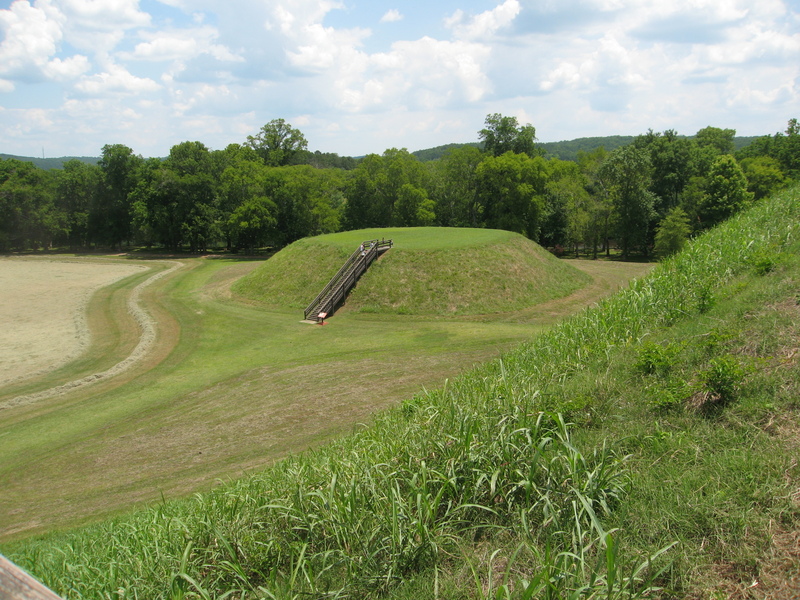 The Etowah site has 3 mounds, and the rest of the site is the village site, where their daily living would take place. Excavations show several structures were on top of the two larger mounds. The smallest mound was a burial mound where they excavated and removed 330 graves. 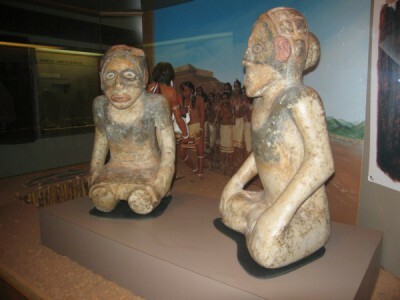 A lot of the artifacts that are on display in the museum are grave goods that they found during the excavation of Mound C. The state of Georgia has built staircases up the mounds so you can climb (or crawl, depending on your fitness level) to the top. The three mounds range in height from 63 feet (135 steps), 25 feet (46 steps) and 10 feet (34 steps – not sure why this one needed quite so many steps!). I counted the number of steps on the two smaller mounds, but I trusted the little boy who told me he had counted the steps on the largest mound. 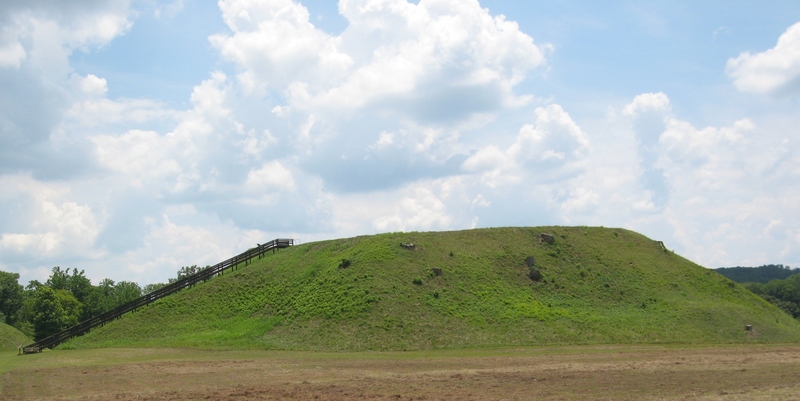 The Etowah site also had a community square area at the base of the largest mound where people traded goods and played chunkey, which was a game played with carved stones that had ceremonial significance to the tribe. Players rolled disc shaped stones along the ground and then tried to throw a spear as close as possible to where the stone would stop. Games of chunkey were played by warriors, and doing well elevated their status in the community. The Mississippian culture is a bit of a mystery to archaeologists. They know that the culture are ancestors of the Muscogee (Creek) Native Americans, and that the Creek consider Etowah to be on of their most important ancestral sites. Trading occurred regularly here, and trade items as far away as California have been found at the site. The culture is believed to have been a warring tribe and the site was set up with several defensive mechanisms – an orchard was planted in staggered rows to prevent enemies from shooting flaming arrows into the village, and a fortification wall was built around the village as well. It was a hot and muggy day and it was a pleasant relief to head down to the river and into some shade. 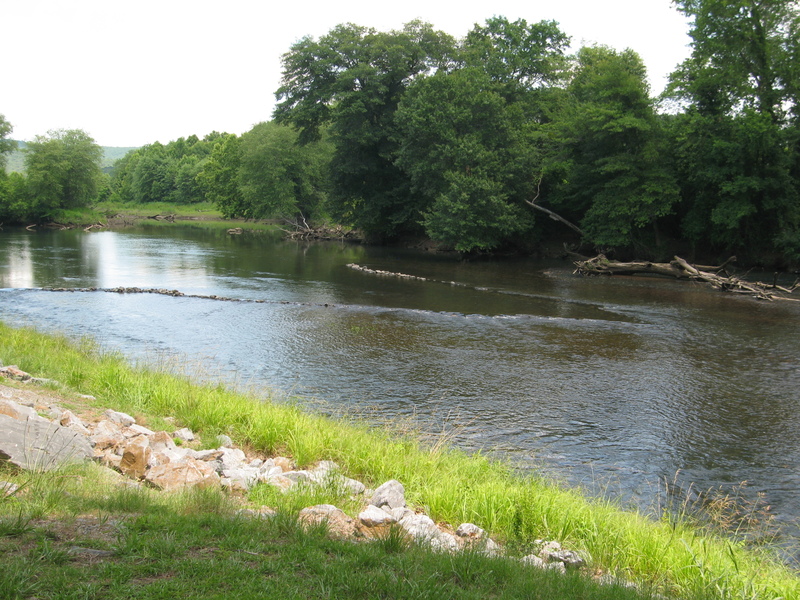 There we saw where the Indians had created a fish trap – a V-shaped line of rocks in the river. They would put baskets or nets at the point of the V to catch the fish (I will remember this strategy if I am ever stranded in the wilderness or marooned on a desert island – with a river of course!). The fish trap that we saw is a re-creation made like the ones that were found by the hundreds at various parts of the river, and it was neat to see, but it is only visible when the water level is low. After leaving Etowah, we got back on the road to head to Asheville, NC. I thought that since we had been heading north, we could just continue on our way north to Asheville. Not so. We had to backtrack south and east through northern Atlanta to get to Asheville. And we hit rush hour traffic. So, at this point, almost no sleep was catching up with us, and we got into an argument… That was kind of a low point… Fortunately it didn’t last too long… (the argument… the traffic lasted FOREVER!) Once we were out of Atlanta well out of the traffic, we stopped along the way at the Jaemor Farm Market, where we split a BBQ pork sandwich and got some Hot Peach sauce and some Peach flavored licorice. Even though the licorice wasn’t local (it was made in Ohio) it was delicious. I figured it still counted as something I tried that I couldn’t get at home too! 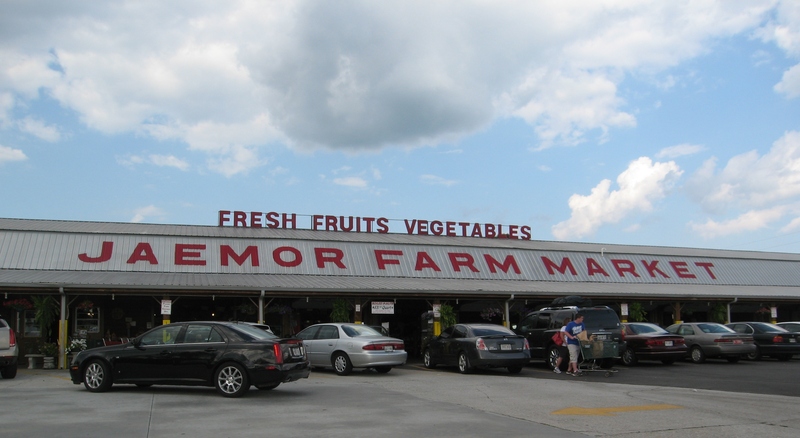 Jaemor Farm Market – Home of a Great BBQ Pork Sandwich! We headed into the mountains and saw all sorts of neat places – antique shops and little stores and things. Of course, they were closed by that point, so that will have to be another trip! You could go camping and fishing and hiking… It really seemed like a great area for a summer vacation, and one that we will certainly have to visit again. Plus, the Great Smoky Mountain National Park is in this area, and we eventually want to visit all of the 47 National Parks in the US. By the time we got to Asheville, we were both exhausted zombies. We checked into our Best Western and went to the ingles grocery store (yes, I didn’t capitalize the i on purpose! – they didn’t either) and got deli salads for dinner. We went back to the room, had our meal and some wine, watched a little TV and hit the sack, for a very good night’s sleep. We flew out on the red eye from Seattle on Thursday, June 7, and arrived at the Atlanta airport about 6:50 am on Friday, June 8. The flight was smooth and completely uneventful, and we were both able to get some sleep. Jon had taken a couple of Xanax that his doctor prescribed because he is nervous about flying, and when we got off the plane, he was like a zombie. Walking… really… slow… It was a little bit annoying actually, because I was ready to start our vacation and get our tourist on! We got Jon a tea to wake up and went and picked up our rental car. 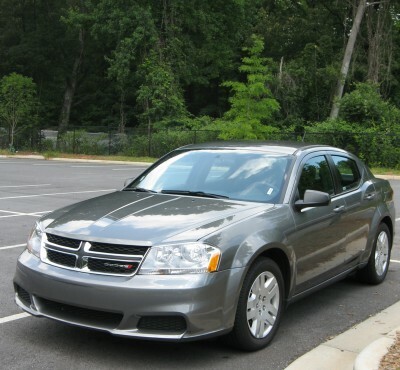 We got a Dodge Avenger – I’ve never driven one of those before – kind of sporty! At this point, Jon thought he was ok to drive. Um… NO! 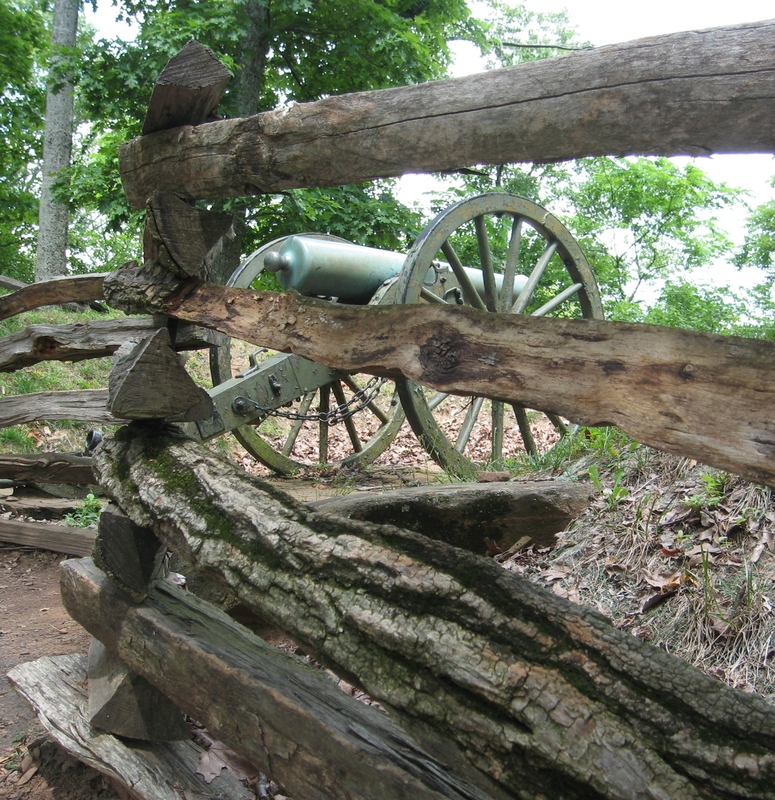 I got behind the wheel and we headed out and plugged our first destination into the GPS – Kennesaw Mountain National Battlefield Park. 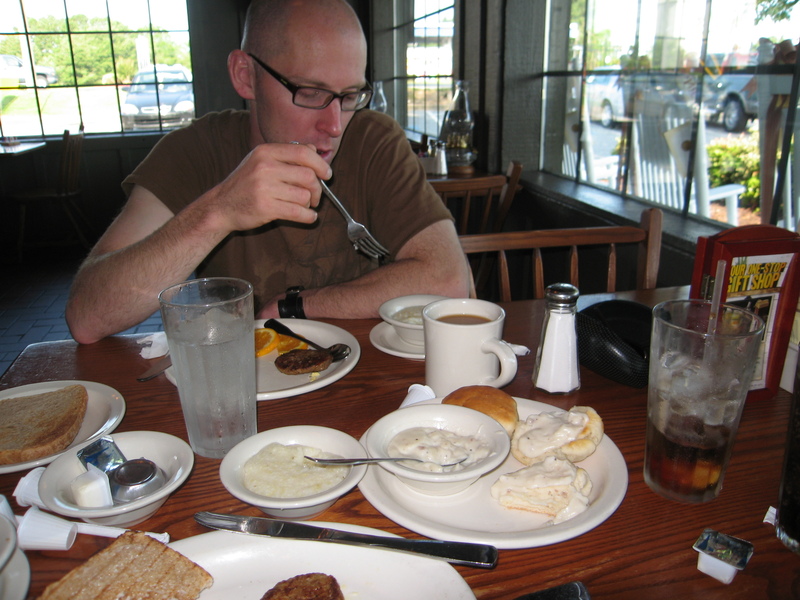 Along the way, we got some breakfast at one of my favorite chain restaurants on the road – Cracker Barrel. Jon had his first taste of grits, and I had some of their delicious baked apples. 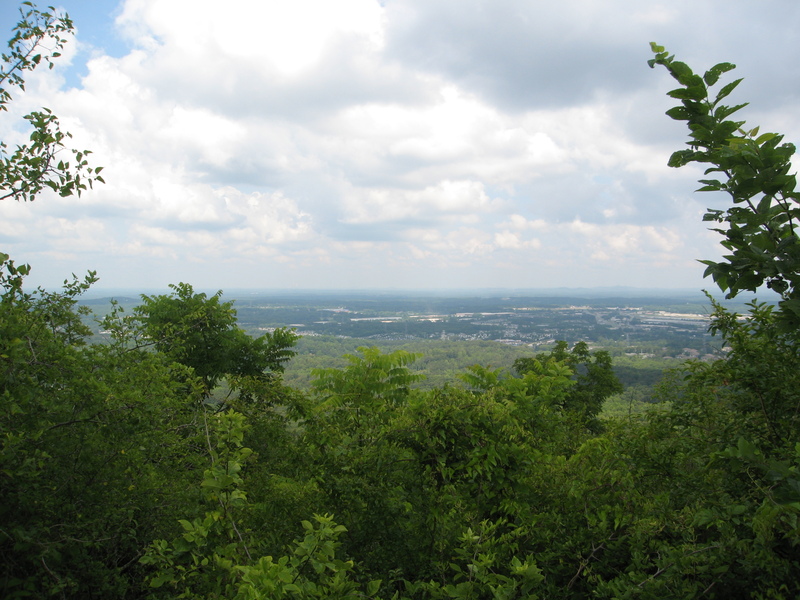 Kennesaw Mountain is 20 miles from Atlanta and was the last big mountain (more like a hill for us West coast natives) that the Union had to either assault or go around in order to capture Atlanta. General Sherman tried to outflank the Confederates and maneuver around the mountain first. When that didn’t work, he planned a direct assault up the mountain, with his 100,000 men against the Confederates 50,000. Due to the Confederates dug in position at the top of the mountain, the assault meant heavy casualties for Sherman, 3,000 casualties to the Confederates 1,000. After the direct assault didn’t work, Sherman moved around the mountain and got the Confederates to engage on the route to Atlanta. Even though the battle took place on June 27, 1864, Atlanta wasn’t captured until September 2, so clearly the Confederates still had plenty of fighting left in them. We hiked up the mountain (hill) and pondered the horror of what happened there (at least I pondered – I think Jon was mostly wondering why I was going so slowly – he had woken up by now!). It is a very peaceful place now. 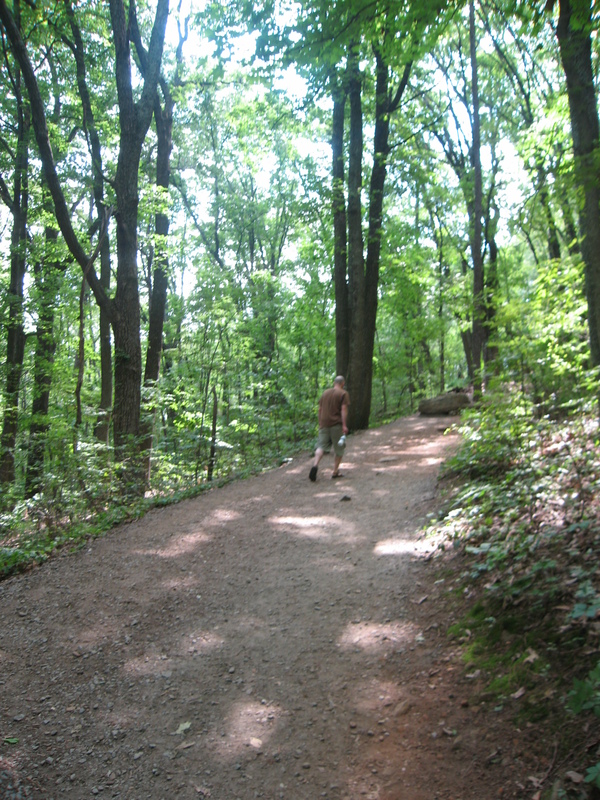 The hike was about a mile up to the top of the hill, but it felt longer because it was steep and humid. I can’t imagine trying to climb up under cannon and rifle fire! It is interesting to see the photos of the battlefield online and see how different it looks now, with the trees grown back and the ravaged land healed. The Visitor’s Center has a great 20 minute movie on the battle, which I hadn’t studied much prior to our trip. It was very informative, and had historical photos and quotes from soldier’s intermixed with the narrative. There is also a small museum documenting the battle and the players involved, and showing some of the artifacts that have been recovered from the battlefield. One thing I thought was really interesting was a section of a tree with several cannonballs embedded in it! Plus I got a stamp for my National Parks Passport. I know it’s kind of nerdy, but I got a passport that the National Park Service sells, where you can get a stamp at each National Park and National Historic Site that you visit. A neat souvenir of our travels! I got my passport a couple of years ago, so I didn’t have any Southeast stamps yet. Until now! From the top of the hill, you can see Atlanta in the distance, and imagine what the soldiers went through, fighting battle after battle in an attempt to make it to Atlanta, 20 miles away. It gives me an appreciation for how easy things are for us now, as we walked back down the hill. 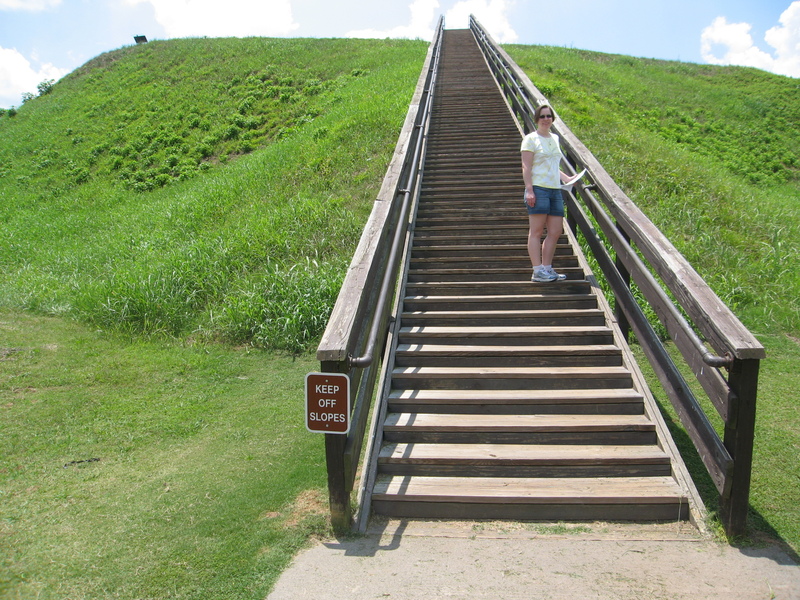 After our Civil War foray, we drove a short distance away to the Etowah Indian Mounds for a step further back in history. We made the decision to visit the South because I wanted the opportunity to get back to see some of the more historical areas of our country. When you live in the Northwest, history is either the history of Native American settlements (which tend to be rather sparsely documented, due to the transitory nature of a lot of these settlements, and the fact that the tribes did not have a written language), or history of European settlement in this area that goes back at the very most about 150 years. In our city, the oldest building we have was built by George Pickett (of later Civil War fame) in 1856. 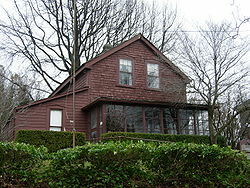 After that, there really aren’t any other homes until the 1880s. 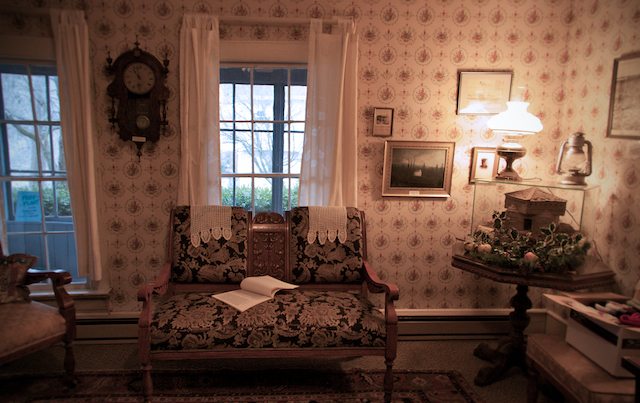 The Pickett House has been extensively remodeled/updated (although many years ago, and now it seems very dated – think flowery wall paper and old carpeting), and the Northwest weather has taken its toll, causing the home to smell significantly of mold. Oh my, I’ve already gotten off topic! Jon, without my intervention, would plan every vacation to California, so I put my foot down several months ago and said that our next trip would be to Civil War Battlefields! Jon, although he loves history, wasn’t all that excited about a trip of exclusively Civil War battlefields (I’ll keep working on that though), so there had to be other historical interest in the places we picked. That wouldn’t be difficult, considering anyplace with Civil War battlefields will have other historical sites too. We settled on seeing Charleston, South Carolina, and Savannah, Georgia. I had been to Savannah before, and loved it, and had been to Charleston for one afternoon, but have always wanted to see more. We originally planned to fly into Charleston, but plane tickets there were running about $650 per person! Savannah was about $100 less per person, but still pretty pricey! So, we settled on Atlanta, where we could save almost $300 per ticket and rent a car for $240 for nine days. As for the rest of the itinerary… We pondered the Biltmore Estate for awhile before we decided to drive out of our way to see it. Asheville isn’t really on the way to anything from Atlanta (unless maybe you are heading to Knoxville, Tennessee), but the Biltmore is one of those ‘bucket list’ places for tourists, especially history nerds like me. Plus my mom was enthusiastically encouraging the Biltmore detour, since she has always wanted to see it too! And Andersonville National Historic Site. I know many of you will find that morbid, but you can’t be a Civil War buff without having an appreciation for all aspects of the war, and certainly the Civil War was bloody and gruesome even without POW camps. I had an interest in seeing it when my mom and I visited Georgia in 2004 and didn’t, so I figured I shouldn’t pass it by again. I knew that would be a lot of driving, but Jon says he likes to drive! And I’m always willing to drive too, although he rarely lets me. So with those being the four corners of our exploration route, we were set! As for lodging – obviously, I would love to do a trip where I stay in all historic hotels in the historic areas of all the cities I visit. Spa massages and gourmet meals would be on the wish list too… But until I get that anonymous benefactor, we’ll have to continue to compromise. We decided we would stay just outside downtown Charleston, and in the historic district in Savannah. While researching hotel options, I also found a neat historic hotel that was reasonably priced in Americus, Georgia too, so that went on the list too. Jon isn’t that great about deciding what he wants to visit, but I knew that if I did too much of one thing, he would start to rebel. I could do every historic home tour I come across, but for Jon, he gets trompe l’oeil and antique furniture burnout. So I tried to find a mix of different things along the way. Native American history sites, Civil War stuff, and some nice antebellum architecture thrown in too. And National Parks. With some good food and wine. And some ghosts. So I researched, and gave Jon some options, and he said he didn’t care, so I picked! For the most part, we stuck with the original plan even! Except I planned to go swimming more (but it was the rain that changed my plans)! So stay tuned for future installments of the 2012 Grand Tour of the South! Don’t worry, loyal blog readers… (all half dozen of you!) I have not abandoned you! Jon and I took the last 9 days to do a “Grand Tour” of the South, with visits to the states of North Carolina, South Carolina, and Georgia. I had intended to do some mini blogs along the way, and get some comprehensive posts ready for when I got home, but karma had its own plan. Jon’s laptop bit the dust on the first day of the trip! And since it is pretty tough to type much on my Kindle, we ended up with a rather low-tech vacation! I had brought a paper (paper of all things – CRAZY!) journal with me, so I took notes and started devising my blog posts to share all of our adventures! So bear with me as I sort dirty laundry and try to get the spray on sunscreen stains out of my ivory sweater (yes, that was another minor mishap…) and I promise I will transcribe and photo-accessorize our entire eclectic vacation itinerary to share with you. Lots of history, dead people (ghosts and otherwise) great food, long drives, full memory cards (and a bit of a panic when the new one didn’t work! ), thunder and lightning storms, and sore feet but no sunburns! Small towns, big cities, merchants, slaves, soldiers, and some Native Americans! We had it all! I just need to do a lot of typing and uploading of photos. I know this blog has been a little quiet for several days, and I apologize. After my last post about our wine tasting party, I got a sinus infection and was down for the count, plus it has been insanely busy at work, and then there was that little thing called Ski to Sea. Ski to Sea, if you aren’t familiar, is our town’s version of a spring festival. It’s a two week long celebration that includes a kiddie parade, a Grand Parade, a Carnival, a kiddie race, an adult race, and a Beer Garden. I think the Beer Garden is the best part! Anyway, Ski to Sea has been part of the tradition since I was a baby, but the last several years Jon and I have done what wise locals do and ske-daddled out of town for Memorial Day Weekend. However, this year, Jon and I are saving up for a nine day vacation that is coming up (a first honeymoon of sorts – since we haven’t had one yet), and we decided to forego our Memorial Day wine tasting trip and stick around home for a change. The groundwork had already been laid for staying home when Jon got a text from an old friend of his a couple of weeks ago asking if he was going to be around, and if Jon would consider taking over the running leg for a team in the Ski to Sea race. The friend has gotten injured and wasn’t sure if he would be healed by race day. Jon said he would, thinking the friend would surely heal up by the time of the race. Alas, it was not to be. So that’s how Jon came to be running in the Ski to Sea race 2012. Again, a bit of background for the unfamiliar. 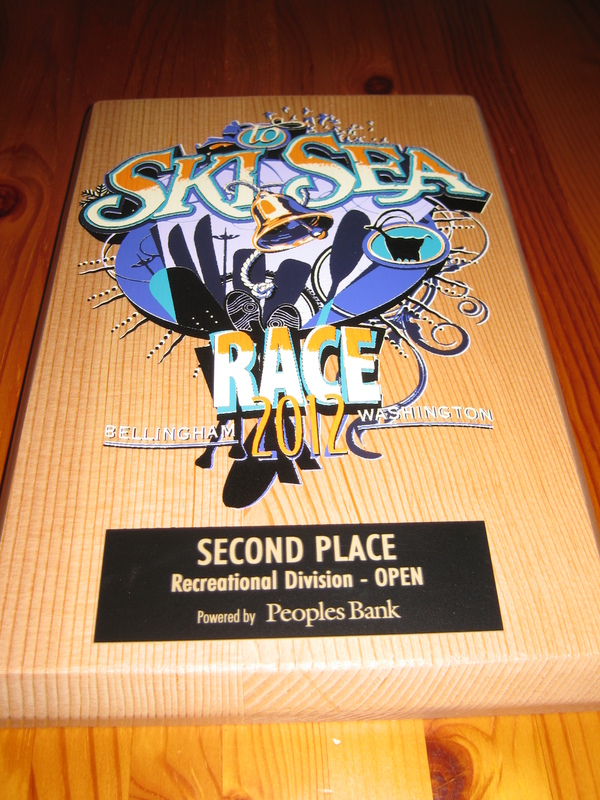 The Ski to Sea race is a 93.5 mile relay race consisting of 7 legs and 8 team members. It starts at the ski area on Mount Baker and goes all the way down to the bay. Cross country skiing, downhill skiing, running, road biking, canoeing, mountain biking and sea kayaking. If you are wondering why 7 legs and 8 people, wonder no more. The canoe is a two-person canoe. So, now Jon is on the team – little did he know this commitment would basically require the entire weekend. Saturday night was the pre-race party and logistical meeting. Yes, they have to coordinate timing, carpools and “who needs to take whose stuff” so they will have warm clothes to change into after the race. Then the final sentence. To make the start of the race, they have to leave town by 4:45 am. So Jon had to get up at 3:45 to get ready and be at his friend’s house at 4:30 to get to the other friend’s house by 4:45. Yikes. I considered going along for the ride, to be a supportive wife and cheer him on, but I was secretly elated when I found out the carpool car was full. Well, maybe not so “secretly”. You see the trouble with the early legs of the race is that they close the road to the mountain. So even though Jon’s part of the relay would likely start at 8:30 – 8:45 am-ish, he had to be at the top of the mountain with the carpool at 7. Then after the running leg of the race (which took him about 45 minutes), he had to wait until they reopened the road so the carpool could come back down the mountain to pick him up. The road reopened at 10:30, so Jon had to wait another hour and a half after he was done running (hence the need for the warm clothes logistics). All in all, Jon left the house around 4:20 in the morning and didn’t get back until after 1 pm. All to run 45 minutes! You can see why I so gracefully bowed out! Jon’s 2nd Place Win Plaque! After the race, in the evening, we went to a party at one of the team member’s house. These were folks who were very cool, but didn’t seem to like wine, so sadly I had a weekend of drinking beer. It’s been a long time since I had a Bud Light… It reminded me that there’s a reason I don’t drink them – micro-brews and wine are much better!